I am not even sure what it’s called, but look at it, does it even matter? This looks so good. I would like to have one. 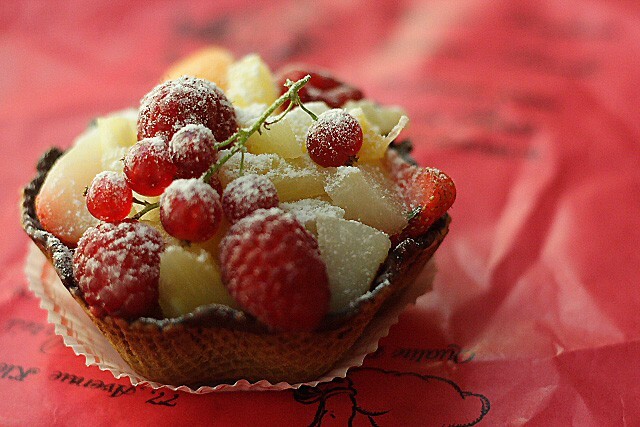 Yes, I agree that Paris has very good patiserie that offers very good pastry and little tarts and cakes like these. Have fun there. I need something sweet everyday! yummy! and such a beautiful pic! What a great looking summer dessert! Oh my goodness, you’re so lucky you’re in Paris! I’ve only been once but it gave me some of my best food memories, naturally. Have fun! So tempting I felt like “taking” it out from my monitor screen!! I miss Paris!!! Anyway, this looks so good that I have stumbled! when i was in Paris, i ate so much it was so bad! especially in the latin quarter where loads of culinary goodies can be found. great pictures. the crust looks so delicate but solid enough to hold all that fruity gorgeousness within. beautiful! A sweet taste of heaven … that’s what I would call it. Rosa, you really out done yourself on this one. Just stunning and belongs on the cover of a magazine! I love the fact you left the stem on the berries on top. Beautiful!! i din remember having this the last time i was there. you make me miss paris. Another winner! Bummer about Tastespotting though…. Hope you had a fantastic time in Paris. I love it everytime I am there! I just came back from California! Love it! the composition n arrangement of these fruits n their colors and textures against tt background is just breathtaking! It doesn’t look hard to make. You said there’s a cream puff filled with pastry cream underneath the fruit? That’s original. Now if you want me to make it for you that’s different. I’ll make sure to include it in your 24 courses tasting menu. haha. Zen – thanks so much. Sounds simple enough to make, but I think I will wait for your 24-course tasting menu. You can’t hide from me, I will hunt you down!!! Whahahaha.